The first written record of Levice is from 1156 and mentions Martirius, the archbishop of Esztergom (Hungary), who consecrated the church in Bratka village dedicated to St.Martin. A parish was established where the villages "villa Leua" and Vitk were annexed . At that time the village of Leua (Levice) was a subject of the Tekov castle, and was situated on the eastern part of today’s town of Levice, somewhere on the slopes of the vineyard, which is still called Old Levice. The castle in Levice was built in the 13th century, when the Tartar-looted Tekovsky castle’s importance had declined. It was built on andesite rock, the remnants of Neogenic volcanic activity, which extended to the Štiavnica hills. The west side of the castle was bounded by the marshy meadow of the river Hron, with its several river branches. 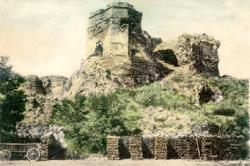 The castle itself had been a fortress for protection of the mining towns. Under the protection of the castle in the 14th century a settlement known as "Big" or "Old Levice" had been established, which is the real predecessor of today’s Levice town. The 150 year long Turkish occupation, which started in the 16th century, weakened the town economically and made it more dependent on the castle’s estate. At this time the Levice castle, then already a royal castle, was listed among the 15 most important defence forts. In the middle of the 17th century the Turkish incursions grew stronger. Seeing the enemy’s huge numerical advantage, the captain gave up Levice without resistance. The Turks' rule in Levice lasted for only 224 days, when in 1664 by an unexpected action they were expelled out of the town. After the end of the Turkish wars Levice lost its important role as a frontier-castle and in 1699 in accordance with official orders it was abolished as a fort. Frequent fires meant great disasters for Levice. In 1696 fire destroyed almost the whole town. In 1715 there were 195 taxpayers and 43 craftsmen in the town. In the time of Rákoczy’s Revolt in the 18th century the castle was in a very bad condition. In order to prevent from being used for military purposes the rebels decided to destroy it before leaving. The castle was never re-established and thus it lost its military importance. 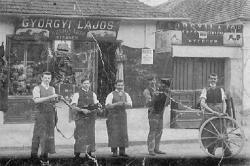 In the second half of 18th century Levice grew significantly and became an agricultural centre of the southern riverside of the Hron, and lively trade and artisanship in organised trades were taking place in the town. The best known and most famous guilds were those of boot-makers, cobblers and button-makers. In the 19th century the number of small enterprises gradually grew; trade, which was mostly concentrated in the hands of Jewish entrepreneurs, developed as well. The investments of the richest families Leidenfrost and Schoeller mostly concerned agriculture and other industries: they built a liqueur factory with a distillery, a steam flourmill, and a brickworks. They also planted new vineyards and developed selective cattle breeding. In 1873 there were 6000 inhabitants in Levice. In the first half of the 20th century during the first Czechoslovak Republic Levice’s architectural, town-planning development began. In 1933 the tobacco-factory was built. In the fifties there was a big housing shortage in Levice, because country people moved to the town in large numbers. 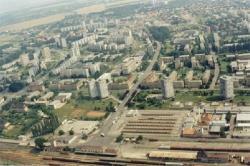 In 1961 there were 13744 inhabitants in the town and Levice became an enlarged district centre. By the end of the eighties the number of inhabitants had increased to 37500. The originally separate communities of Kalinčiakovo and Malý Kiar were administratively incorporated into Levice in 1976, and the settlements of Čankov and Horša joined the town in 1986.